Ballyclare Comrades have appointed David Dorrian as their new manager after Eddie Hill quit the club following Saturday’s 3-1 defeat to Armagh. Dorrian, who was Hill’s assistant, is a former manager of Ballymena United Reserves. In a statement, released on social media, a club spokesman said: “We are delighted to announce the appointment of David Dorrian to the manager’s post at the club. 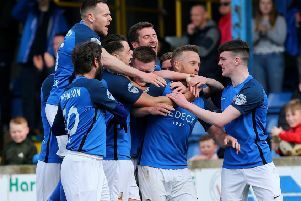 “Davy has a wealth of experience in the local game, including previous roles in the managerial team at Ballymena United, Glenavon and Bangor. Hill’s was in charge at Dixon Park for almost three-and-a-half years during which time he won promotion to Championship 1 and led the side to two Steel and Sons Cup semi-finals. Earlier this season Hill oversaw a shock 1-0 win over Warren Feeney’s Linfield in the League Cup. Saturday’s loss at Armagh leaves the Comrades six points above the relegation zone with six matches remaining.